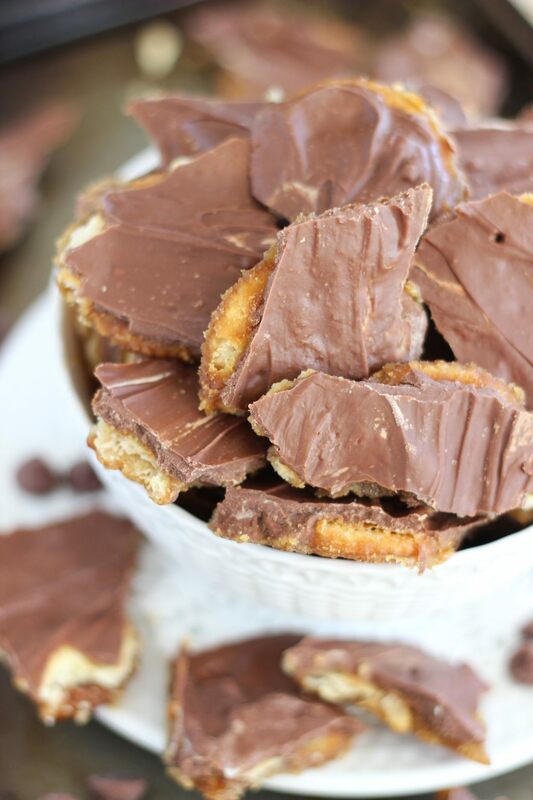 Sweet, sticky, and crunchy Ritz cracker toffee candy with chocolate and peanut butter. Ready in minutes, you can make this anytime! 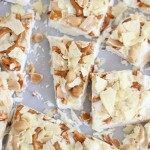 A friend of my mom’s gave her a recipe for homemade Skors bars. I’ve never even had a Skors bar, but my mom made the recipe around Christmastime, and we all loved this treat. My very first thought after trying this candy was: I have to add peanut butter to it! It was incredibly easy, and it only took a few minutes to make. It might not be much to look at, but it’s really divine! 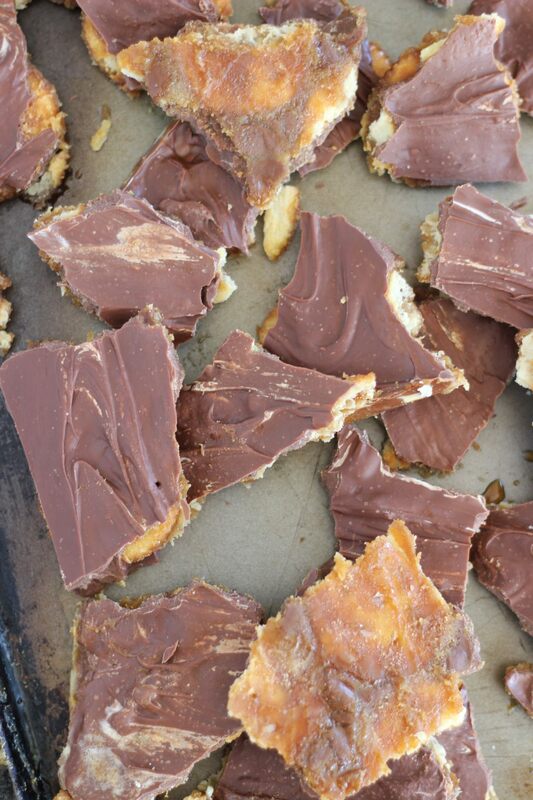 It’s basically cracker toffee covered in chocolate and peanut butter. The first step is to cover a cookie sheet with a single layer of crackers. Combine butter and brown sugar in a saucepan, and cook it until it’s a nice, thick syrup. Whisk in a little peanut butter. 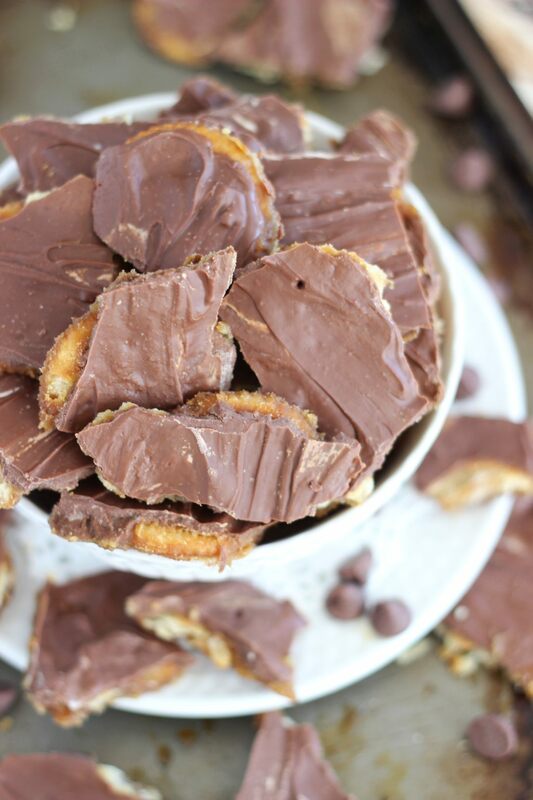 Pour it over the crackers, pop them in the oven for a few minutes until the syrup gets bubbly, and then slather them with a mixture of melted chocolate and melted peanut butter, while the crackers are still hot. Once the candy sets, you just break it into pieces. The original recipe calls for club crackers, but I would absolutely 100% suggest Ritz. We didn’t have an entire sleeve of either, so my mom made these with half club crackers and half Ritz. It was unanimous that the Ritz are significantly better. The club crackers are a little cardboard-like and don’t really add much to the candy, while the salty and buttery Ritz are much more interesting and tasty. 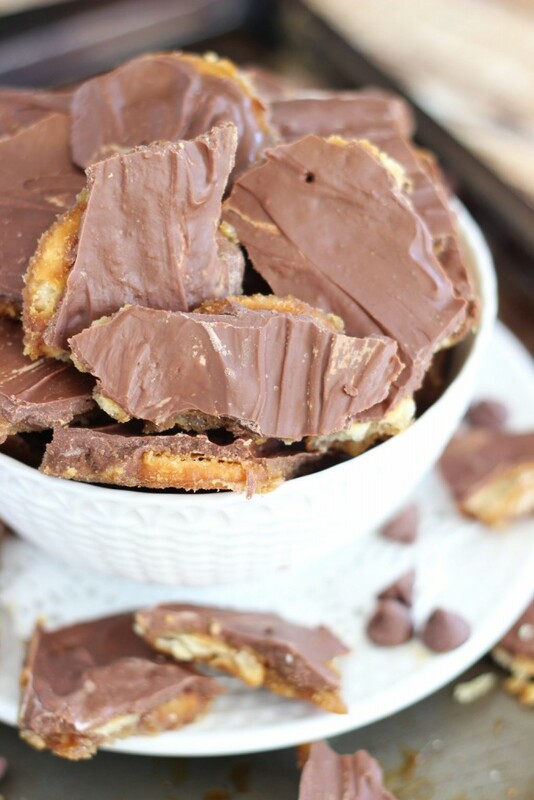 The saltiness cuts through the sweetness of the toffee and chocolate, while the buttery-ness of the crackers is simply more flavorful. 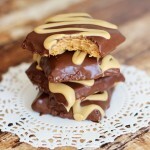 I also prefer these peanut butter toffee bars with milk chocolate, rather than semi-sweet. The boldness of semi-sweet chocolate is a little overwhelming to the rest of the flavors, but smoother and milder milk chocolate is a perfect complement. 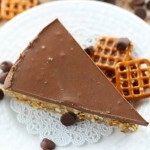 It isn’t a fancy dessert, but it’s really divine, and it’s simple to make. It’s a great recipe to keep on hand for those times when you need to pull something together in a time crunch, and you want it to be a crowd-pleaser! 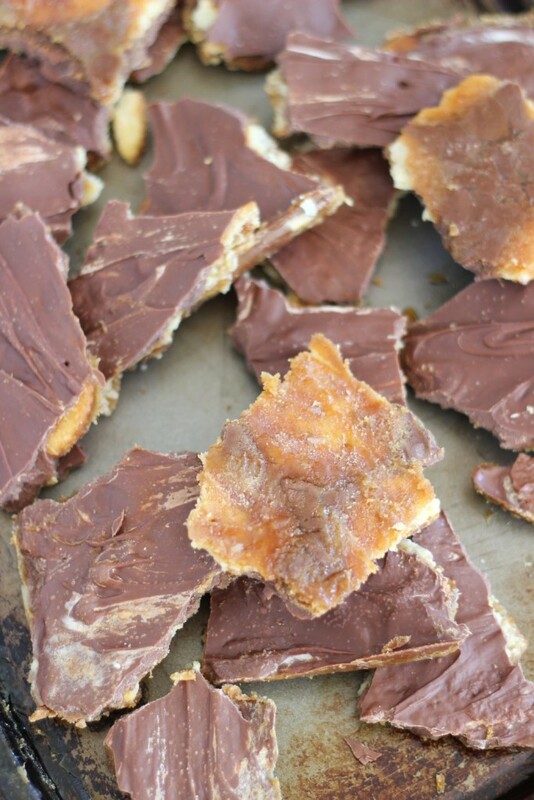 This peanut butter toffee bars recipe is now a go-to recipe for me! Toffee and peanut butter? Count me in. Yes!!! Mom made this at Christmas, remember? I’ve made these for years but with saltines! I love the Ritz and of COURSE the peanut butter enhancements! You must switch to Ritz!!! You won’t believe the difference, truly! Wow! This looks delicious. I can’t wait to try it! Pinning it. This could be dangerous to have around the house. Very dangerous. Thanks for sharing on Creative K. Kids Tasty Tuesdays. We have never made them with Ritz crackers! I bet that would be yummy. We make them with saltines all the time and we’ve tried a PB versions (which we just LOVE). You really MUST try with Ritz! It’s truly much tastier! More buttery and flavorful!!! Thanks so much. I love peanut butter and could eat these all day! I’ll definitely have to make them soon! Thanks so much for sharing your recipe with us at Share The Wealth Sunday! I’m loving this recipe! Thanks for sharing; I just found you on Bouquet of Talent as a feature too. 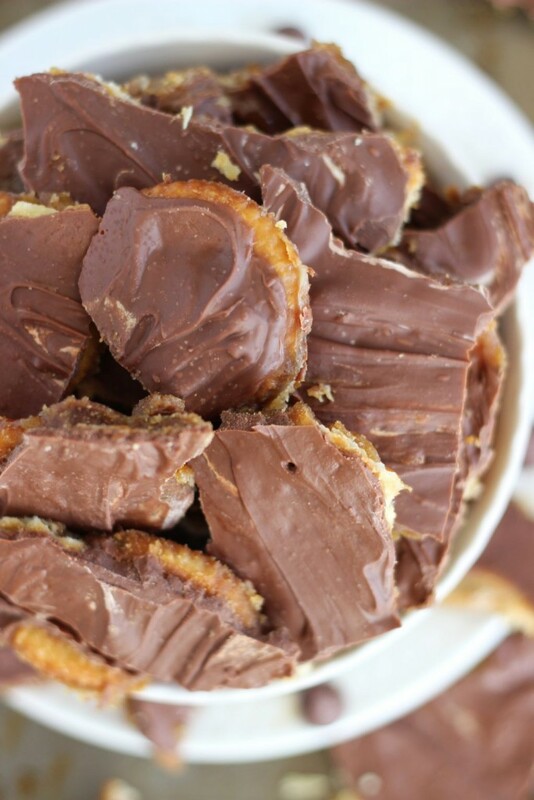 There’s nothing better than a combo of sweet-salty and adding peanut butter and chocolate to it is just amazing. YUM! Thanks for linking up with us at the best of the blogosphere. We’d love to have you back with a new post! I totally agree! Thank you for the party! 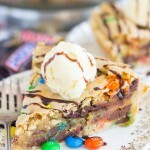 What a fun twist on this old recipe! I know I’d like it even more! Looks delish and thanks for sharing on Throwback Thursday! I made these yesterday but had to use semisweet chips. It didn’t matter. You can still get the buttery Ritz flavor and the peanut butter wonderfulness. 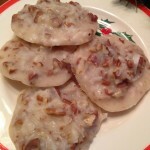 Another FABULOUS recipe from this AMAZING webiste! THANKS! Oh and YES, VERRRRRY dangerous to have around.